It would be good for all of us to remember that our Father will judge us with the same mercy, or lack thereof, that we judge others. Ouch! The greatest commandment we’re given is to love God and love each other. We’re to be quick to forgive and that’s not always easy to do. I believe God wants us to learn forgiveness not for the other person, but for ourselves – to maintain our peace of mind. If we harbor a spirit of unforgiveness, it complicates and compromises our daily walk with God. We need to be released from inner anguish and anger in order to receive the healing we need from God – and the only way that can happen is through forgiveness. God doesn’t want anything to stand between us and Him. Inner anguish and anger certainly qualifies as something that would get in the way of our relationship, don’t you think? God loves us more than we can begin to comprehend, and He has a wonderful plan for us, but if we continue to let unforgiveness get in the way, He can’t work in our lives like He wants to. I want to be forgiving so God can work in my life. In our world, forgiveness is seen as weakness. To forgive another person for wronging you is probably the most difficult thing to do and is, in my mind, a sign of great strength. Some people think that you have to let the person back into your life after forgiving them – and again… no, you don’t. You forgive, but you’re not a fool – just keep walking. Actually, there are some situations where you do need to allow people back in your life – but in those cases you need to set some ground rules with them so they don’t mess with you again. An example would be family members. You really can’t walk away from them, but they can hurt you badly. Make it clear that you won’t tolerate it again. Of course, we know that we are to forgive as often as necessary, but making sure they know the rules will hopefully be enough to take care of the problem. God didn’t create doormats. We’re not on planet earth to be walked on by others. Being taken advantage of for our kind nature is not what God had in mind for any of us. By the same token, God didn’t create us to walk around with a chip on our shoulder either – just waiting for the next person to come along and knock it off and start a fight. There is an in-between there, and it’s found in a solid relationship with God. If we understand our purpose for living – to share Christ with others – then we understand that no matter what happens in life, our Lord will provide a way of escape from it, and we have to be ready to face it, work through it, walk away from it and let it go. Some of us don’t get much practice, and some of us get a great deal of practice. Regardless, we need to know how to forgive and by God’s grace – forget it. If we don’t, God can’t forgive us. If you needed to find motivation to forgive, there it is. 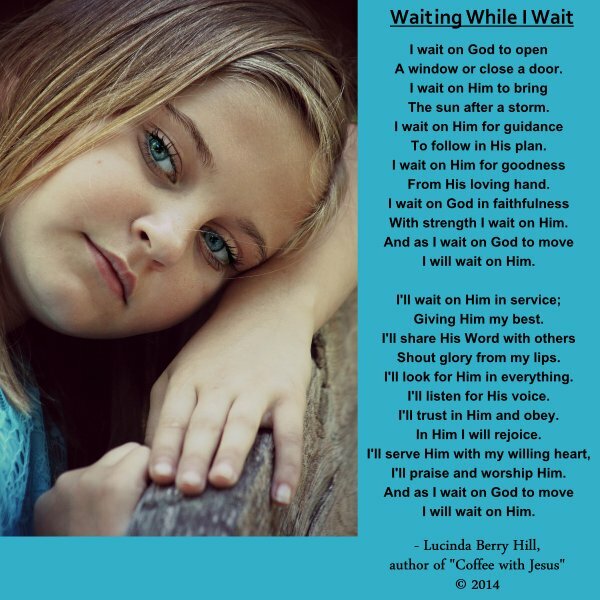 I don’t pay attention to how many people follow this blog, but if you are reading this post today, I humbly ask for your prayers on behalf of my talented friend, Lucinda Berry Hill. We don’t know what the problem is, but we most definitely know WHO the Great Physician is… Amen! (1) This is a long piece, and (2) I must share this even if it’s not in the form of a design. Please read and pray. Thank you! I’m sitting in this hospital bed looking for a pen. But how could I forget a pen and some paper? I pray that God will help my daughter sleep. And wonder where they’re coming from. But that He’ll give her peace and help her sleep. I pray that my husband will be comforted. Of the last time he saw his beautiful mother. I pray for the person out in the hall. Whoever works a mop at 12:00 at night needs prayers. How do I know it’s a mop? I’ve been professional cleaning for over 27 years. I know a mop when I hear one. And oh, those trash bags!!! So, I pray for them. Maybe their little ones are home in bed. Maybe they like the night shift. Praying for all possibilities out in the hallway. I hear someone nearby faintly crying. And the comfort of their loved ones at home. I know as a mom now myself, she’s hurting. I pray for her comfort. Will reunite some estranged family members. I wonder what’s going on with me. Is God gonna make me better than I was when I came in? Being able to live a better and more vibrant life than before? I can rest assured my God does! She couldn’t be in better hands. I know she will have a beautiful life. With love, joy, peace and hope! Part of an every 2 hour cycle. She did and said I could keep it. I prayed the Lord would keep her in His hands also.